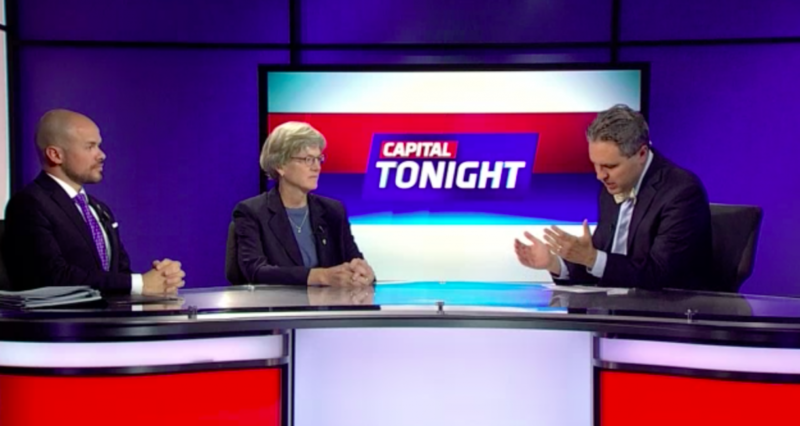 Representatives Justin Burr (R-Montgomery, Stanly) and Marcia Morey (D-Durham) debated Thursday night on Capital Tonight about judicial redistricting. 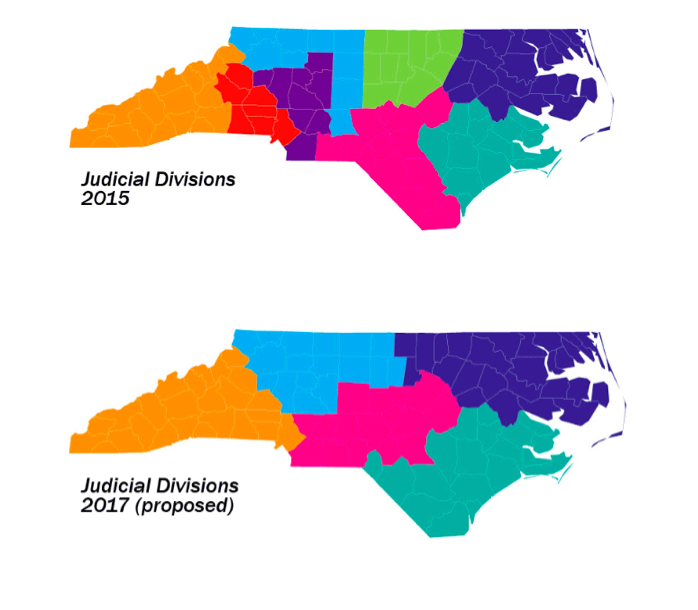 New judicial and prosecutorial maps that would overhaul the state’s court system will be moving full-steam ahead next week as the House judicial redistricting committee meets for the first time. Rep. Justin Burr (R-Montgomery, Stanly) introduced the maps via Twitter at the end of the long session but things were put on hold through the end of the budgeting process. He was heavily criticized by both Democrats and the legal and judicial community because he created the maps in secret without any input from the judicial branch. He’s also been accused of politicizing the judiciary through the maps, which would change the way all the state’s judges and prosecutors are elected. It’s been reported that Burr is pushing for redistricting to add more Republicans to the bench. Rep. Marcia Morey (D-Durham), who is a former longtime district court judge, has been an outspoken opponent of the maps. She has expressed concern about the pace at which judicial redistricting is moving and what such an overhaul would mean for sitting judges and the cases they preside over. Burr and Morey appeared Thursday night on Spectrum News’ Capital Tonight to debate the issue ahead of next week’s meeting. He said the old districts were drawn to favor Democratic judges and that the new maps would bring things back to the center, creating a more fair process for voters. “It moves it back to the center and if that gives it the appearance that it’s more favorable to Republicans, it’s only because we’re cleaning up old gerrymandered districts that disenfranchise the voters of this state,” he said. Morey responded that she didn’t buy his argument. She said judges aren’t political in what they do; they’re non-partisan. “I’ve talked to judges all over this state — I know Rep. Burr has — and they are unanimously they are opposed to this,” Morey said. She agreed with Burr that perhaps some changes were needed but said the process has to be slow and involve all stakeholders. Burr said he doesn’t think the status quo is acceptable. “How much longer should we wait to fix these districts?,” he asked. He said his meetings with judges and judicial leaders across the state have gone well and that he’s reviewing some “tweaks” they’ve provided. Ultimately though, he said, judges are welcome to provide their feedback but the Constitution is clear that the General Assembly establishes judicial districts in North Carolina. He criticized many of the judges across the state because they had expressed concern about incumbency protection. It should be noted that despite Burr’s comment, he voted just weeks ago for Republican lawmakers to use incumbency protection as a criteria when redrawing legislative districts to correct unconstitutional racial gerrymanders. It was a criteria that worked out well for Burr, who was at risk himself of being double-bunked in the new legislative maps — coincidentally though, he was not. Morey responded to Burr’s argument about incumbency noting that sitting judges were very committed to the judiciary. “The longer you’re a judge, you learn your craft, you interpret the laws, you become better and better and to suddenly have incumbents running against each other, you’re going to lose quality from the bench,” she said. She added that there were many disproportionate districts in the new judicial maps that needed to be looked at closer. You can watch the entire news segment here. The House judicial redistricting committee is scheduled to meet at 1 p.m. Tuesday in room 544 of the Legislative Office Building. The meeting is open to the public and the audio will be live-streamed here. The judicial maps are expected to pass the House before the end of the year, but it’s unclear if the Senate will be on board. Senate President Pro Tem Phil Berger has been testing the waters with a merit selection process, which would do away with judicial elections altogether. You can read more about that here. The Redistricting process for the U.S. needs to be removed from the hands of political operatives.